We designed our specification pages with help from engineering experts, so you can be confident that your tank specifications are accurate and meet referenced requirement and performance specification. The performance specifications can also help you understand what type of polyethylene tank best meets your needs. If you’ve got a bidding process you are dealing with, our tank engineering specifications are especially valuable. Using an accurate set of specifications from the start will make the process go much more smoothly, because it puts everyone on the same page at Square One. To begin, you’ll need to determine what type of tank system best suits your particular need or application. Poly Processing offers a wide variety of tank designs to meet your specific application and chemicals. Let’s take a look at some of our most popular tank options. 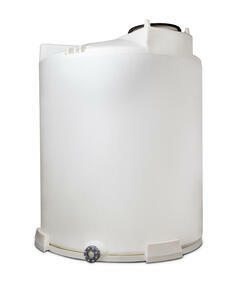 Our vertical tank is a standard cylindrical, upright tank. Vertical tanks are an ideal choice when you already have secondary containment in place. This flat-bottom, versatile tank is available in sizes ranging from 30 to 13,650 gallons. The vertical tank with the Integrally Molded Flanged Outlet® (IMFO) System features a full-drain solution in a vertical tank design. These tanks are available in flat-bottom or slope-bottom designs. Storing highly oxidizing chemicals? Add the antioxidant OR-1000™ interior surface for additional protection that can’t be beat. Sizes range from 200 to 13,650 gallons. Need containment but don’t have much space? The SAFE-Tank storage system is a crosslinked polyethylene tank-within-a-tank that provides 110% containment—without the footprint of a concrete berm. The SAFE-Tank has the square footage of a standard vertical tank and is available in sizes ranging from 55 to 8,700 gallons. To maintain containment integrity between the tank and the piping, Poly Processing has developed the innovative Enhanced Bellows Transition Fitting for the SAFE-Tank. This fitting is the only product on the market to ensure double-wall containment in transition. After you download the engineering specification, customize the parameters for your particular project. Our specifications sheets can convert to either NSF-certified (by default) or non-NSF certified versions. If NSF isn’t applicable to your project, just remove the NSF listings. Depending on the chemicals you’re storing, you may need to select your tanks based on exact specifications, such as OSHA or EPA requirements. Use our specifications as a baseline for making the necessary edits so that you get the exact specification that you require. At Poly Processing, we have a dedicated Specification Development and Review Team, as well as a full-time project manager. We like to be involved in the specification process as early as possible to bring value to the job—and to help the engineer, contractor, and customer save time and money. 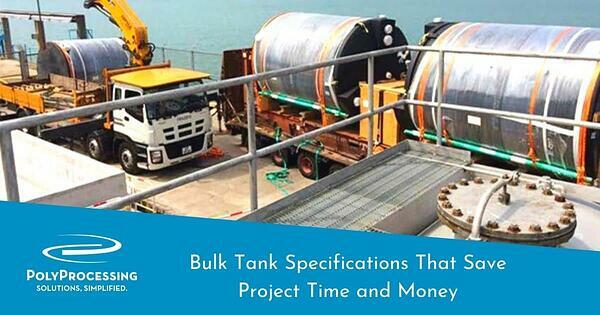 Once we receive the order, our project manager can assist with the project from the moment the job is awarded to the date the tanks are onsite. If you’re looking for expert help developing specification language for a polyethylene tank, contact our Specification Development and Review Team. Our chemical storage tank experts are always ready to provide recommendations for your particular project.